Whether you have two or three days to fully explore the trails or you're taking a short group tour, you'll get the most out of your trip if you plan ahead. Spend two days rather than one on Gallipoli to see everything you want to. Taking your own rented car around the area is the best way to tour Gallipoli. Driving is awful in Istanbul, so when you arrive, take an inter-city bus from Istanbul to Çanakkale and rent your car there. You can take it across to the peninsula on the ferry. If you want to employ a local guide, search online for a good one in Çanakkale and book well in advance. It’s important to understand the scale of Gallipoli and allow yourself enough time to explore. Many people find they don’t have enough time to fully appreciate the peninsula. The Ngā Tapuwae trails are organised around five areas of significance to New Zealanders. 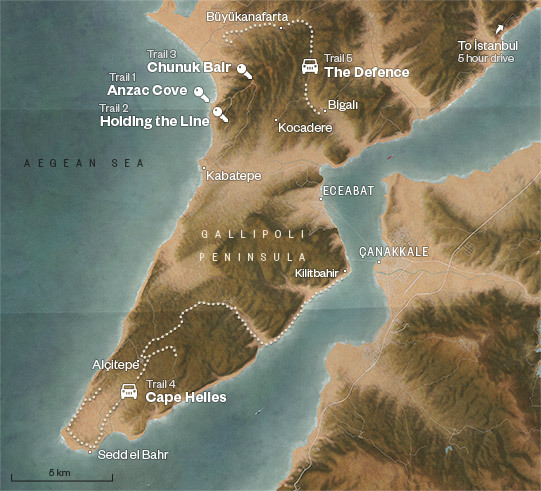 The three key trails around Anzac Cove are where most New Zealanders concentrate their visits. These trails are all within a short walk or drive of each other and are where many New Zealand soldiers fought, died and are memorialised. If you’re planning on taking a guided bus tour, this is where you’ll spend most of your time. If you’re driving yourself, this area can be explored in anywhere between half a day and three days – the more time the better. An overnight stay in Eceabat or Çanakkale is recommended to get the most out of the area. Each key trail’s guided audio tour lasts 1–2 hours, but do add in some extra buffer time. On April 25 1915, 16,000 New Zealand and Australian men – ‘Anzacs’ – stormed this cove to fight Ottoman forces. Little went as planned – and the Anzacs were tested physically and mentally. For two months the Anzacs occupied this territory – holding the perimeter but unable to push further. They endured hunger, thirst, and sickness, as well as the psychological horrors of war. In August 1915 the Anzacs summoned every last scrap of strength, and attempted a daring plan to take high points on Sari Bair Ridge. New Zealand forces briefly tasted triumph when they captured the summit of Chunuk Bair. Those with more time as well as access to a car can explore these two trails as well, to gain further insights into the conflict in Gallipoli. You can spend anywhere from half a day to a whole day exploring each of these trails. While the Australians and New Zealanders held Anzac Cove, the British and French occupied Cape Helles on the southern tip of the peninsula. In May 1915 some of the Anzacs were redeployed here. On December 15, after eight months of stalemate, the Anzacs evacuated, and the Ottomans were victorious. This trail examines the final events leading up to the campaign’s end. If you wish, you can relate any of the trails to your own family history. Search the databases below to find out where a relative might be buried or memorialised.